The Matrix delivers up to 60,000 lumens at efficacies exceeding 125 lumens per Watt and is suitable for post-top, shoebox, cobra-head, high-output flood, and high-mast lighting fixture retrofits and replacements. The post top area fixture is designed to be a one-for-one replacement for 1,000W HID spider mount fixtures. 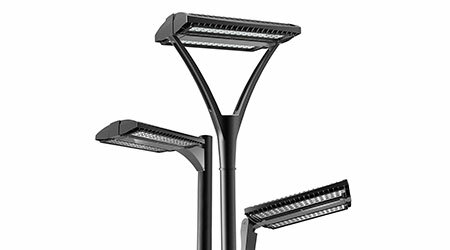 The luminaire features an array of controls capabilities based on specified needs, dawn-to-dusk photocell, and advanced wired or wireless solutions.